Like humans, robots need to be intelligent. Rational. Trustworthy. But that sounds way too complicated, and more importantly, extremely boring. So let’s make them do random stuff instead, and learn a bit about programming on the Pi along the way. 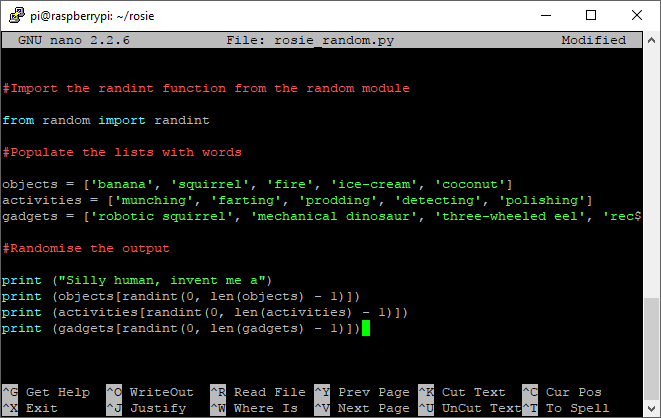 Here, we’ll write a little Python program to allow Rosie to make random suggestions. Specifically, we want her to tell us what we should be inventing next. We learnt previously that Operating Systems - in our case the Linux-based Raspbian OS - allow us to interact with hardware. But the OS alone won't provide Rosie with any real intelligence. She'll in fact just sit there, unloved.. doing nothing. Zero. Nada. Now, drum roll please... Enter the real guardians of the entire galaxy. Computer Programs (or code, or scripts, or software, or applications, or whatever else people like to call them). These things contain rules and logic - described in computer languages - that allow us to process input, and afterwards, provide (hopefully useful) output. Like actual languages (English, español, 日本語, русский + hundreds more), there are many different Programming Languages which are ways in which to write programs. They all have strange names, like C, C++, PHP and Java. 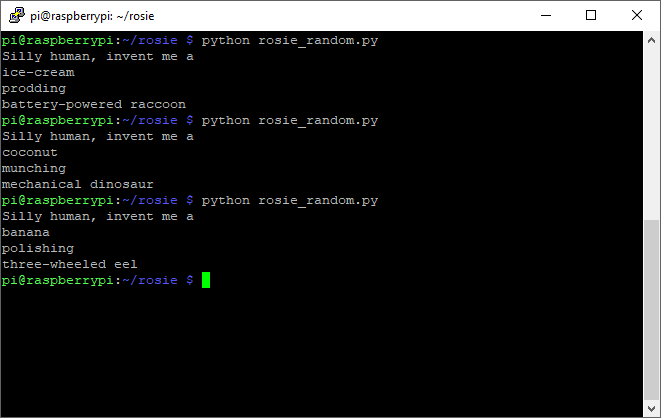 We will use one called Python for Rosie. It's widely used. It's powerful. And - rather helpfully - it's already there on Raspbian OS, ready to be used. And just to prove that we can start to make use of Rosie's brain, we will create an amazingly useful program. Actually, let's not. Let's create a silly little program - and it really is little with less than 20 lines of code - that randomly selects words from some lists and presents them back to us as a world-changing suggestion. Is it actually of any use? Most likely not. But on second thoughts… Rosie might actually need to make random choices sometimes. Like where to go if she’s stuck or bored. Or what shapes to throw on the dance floor. In a way, just like humans. But hang on a second. WHERE? HOW? Python applications consist of files that contain - guess what? - Python code. So let's get back to the SSH terminal that we started during our previous post and create the Python file that we need. 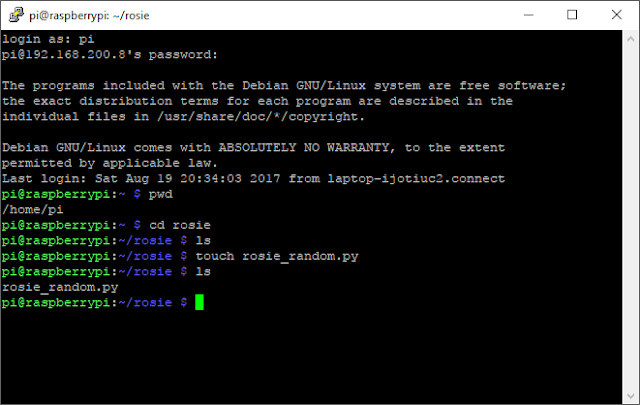 ...changes to the 'rosie' directory we created previously. This is where we'd like to store this Python application. ...lists items in this directory. Anything there? No, so let's create our Python application file. ...touch command creates an empty file. 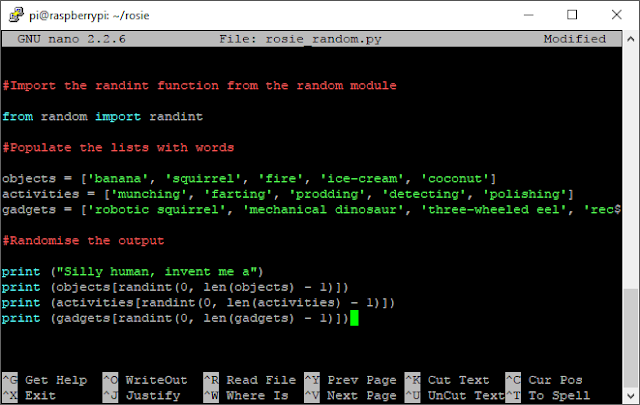 Let's create one called 'rosie_random.py'. The '.py' extension generally means it is a Python file. Great! We now have our file, but it's empty (we did warn you about this). Let's use our old friend 'nano' to edit it. ...opens the rosie_random.py file using the nano text editor. We used this when editing the Wi-Fi configuration file, remember? Once you're happy with the lines you've just pasted in, save the file and exit nano using control-x (control and x keys pressed together), 'y' key at next prompt and 'enter' when confirming the filename. We're all set to go. Let's run the program using Python* and see what happens. *We will be using Python version 2 (Python 2) in this series. We'll move onto using the latest and greatest version of Python (Python 3) at the start of the next series. Python 2 won't be around for much longer. Tip: Pressing the 'up' or 'down' arrow keys will allow you to cycle through previous commands you have already executed. Useful, when you want to quickly see Rosie's other suggestions. There! A Python program has suddenly made Rosie very useful. A 'banana polishing three-wheeled eel' will change lives for the better, and win you the Nobel Prize. But what was it that we just copied and pasted? How did the code work? Let's step through each bit. We import Python modules and their functions whenever we want to recycle bits of existing code. Here, we want to use the randint() function from the random module. Someone has kindly written these modules for us and made them available for use in Python - it would be ungrateful not to use them. Next, we set up three list data structures in which to store our words. This will be our data. Feel free to modify and add words as you please. Subtracting one from the len() result is required as 0 actually points to the first position (word) in the list. Therefore, the last position is number of words - 1.
randint() function is then used to generate a random number (also called integer) between the first and last positions of the words in the lists. This will be the position of the chosen word in the list. You may have also spotted the ’#’ symbol whenever we were making comments in the code. These lines are ignored by Python, but are useful to us humans who quite often forget what we've written (or eaten that morning). We admit it. This application is pointless. It's daft. We could've come up with those suggestions ourselves. But we now know how to create a Python application and run it on the Pi. And this, is making Rosie - and the Pi - ever more useful. Thanks for the fun toot-oreo. 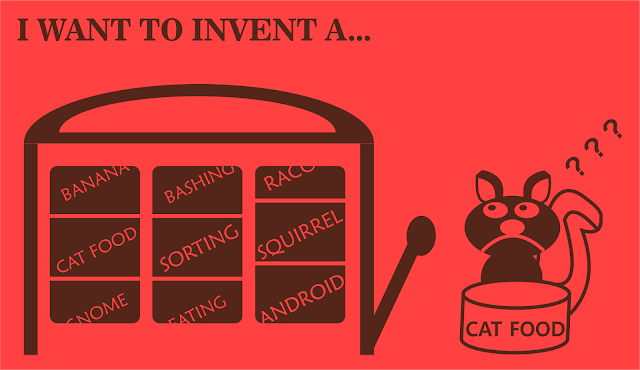 """Module to randomise silly inventions"""
a double thank you - I can be patient... or will be a patient. Hi there. Thanks for this! I never knew there was a choice() function hidden away in the 'random' module. It sure tidies this up a bit.